What a great recipe! 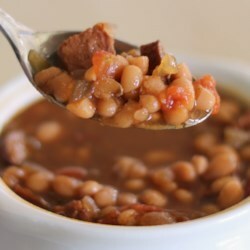 My father used to make very good bean soup, but I couldn't remember just what the ingredients were. I think this recipe has them all, except for carrots, which I added. The one thing I did differently was that I didn't add that last 3 cups of water because we like soups like this to be pretty thick, and this came out perfectly with just the initial 6 cups of water. Thanks, Angela!